CriteriaQuery API allows you to specify the criteria or a condition that you want to apply on a class to access its particular object or a collection of objects. Note : Since Hibernate 5, the Criteria API has been deprecated and hence CriteriaQuery API is used as its replacement to allow us to associate a criteria/condition with a query when accessing the database. Let's understand the necessary steps to be performed in a sequence, in order to use CriteriaQuery API. Let's say that we want to query a class named UserInfo. Creating the CriteriaBuilder from the Session object. Creating the CriteriaQuery of an Object type using CriteriaBuilder object. Creating a Root collection of a type of objects. Root allows us to define attributes in the query, later on. Specifying the item to be returned in the query result(using Root) i.e. objects of a type referenced by Root. 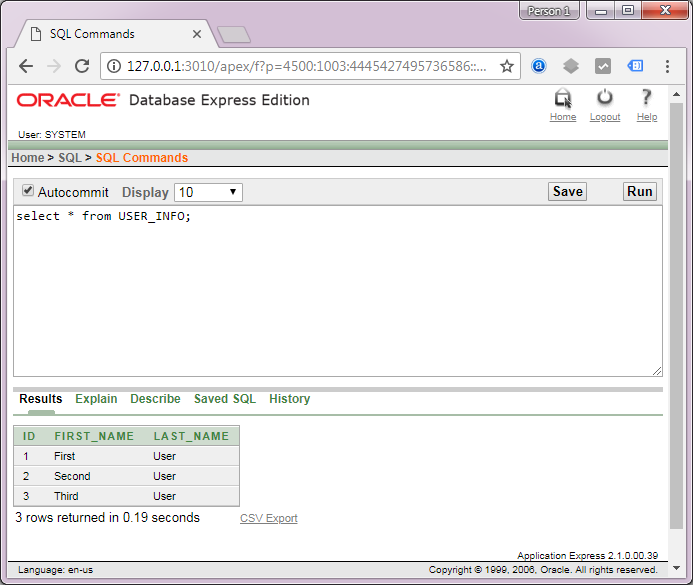 Using Session object to create a Query object to execute the query. Executing the Query to get particular type of collection of records in a List. Executing the Query to get a single value result then we would call a getSingleResult() method and store the result in an Object. Let's understand the CriteriaQuery through an example in the upcoming section. We are going to create a general parent class that will contain all the Java code files representing our Model class(whose objects needs to be persisted). This is a simple Java class whose objects needs to be persisted/saved, these objects are also known as Plain Old Java Objects(POJO) or Entity class. Some may even refer to such class whose objects needs to be persisted as the Model class. This class is an entity class, hence it will be preceded with the @Entity annotation plus a few other important annotations. This class will create some UserInfo objects, which will be persisted in a database table using the Hibernate and finally these objects are retrieved using the CriteriaQuery API. //Using CriteriaQuery to creating a Query object to execute the query. The mapping entity class, used by Hibernate to correctly map the class(UserInfo) to a database table. 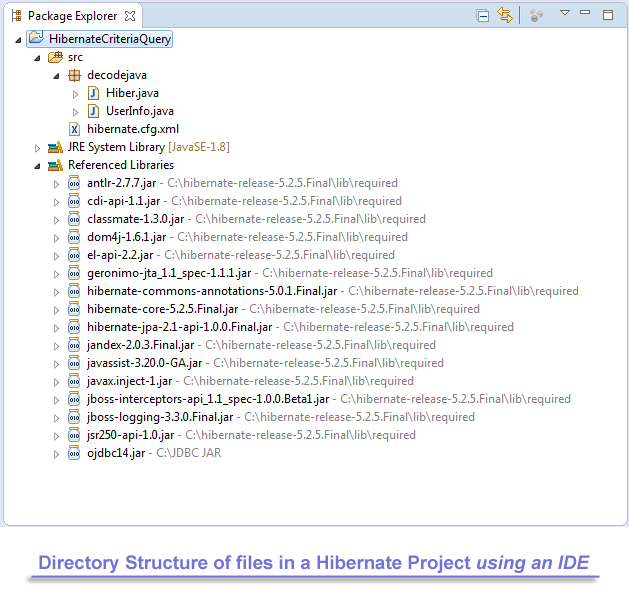 The picture above depicts how and where to arrange POJO/Entity(.java) file and the class(that calls the hibernate into action) in a specific directory structure. Project Folder - HibernateCriteriaQuery is the name of our Project and it is a top-level directory. This project folder contains the main package of our project i.e. decodejava, which contains POJO/Entity class file i.e. UserInfo.java and the class that calls the hibernate into action i.e. Hiber.java. This output shows you all the SQL commands executed by the Hibernate within the database to create the tables and save three objects and finally retrieving all the objects using CriteriaQuery API, which also gets translated to an SQL command. Finally, after executing Hiber class, a tables will be created in the database with the name User_Info. You may query the database and see what are the contents of this table. This table shows you the objects of class UserInfo class mapped by Hibernate to a table named User_Info in the database.